Hole Patch is fluid at rest, but special physical properties enable it to harden when struck by moving cars. Mayank Saksena is studying biomedical engineering at Case Western Reserve University, but lately his mind has been on potholes. That’s because he thinks he’s found a better way to patch them, using a nontoxic, locally sourced, and reusable product. Here’s how it all started. Saksena and a group of fellow engineering students were tinkering around with cornstarch and water, just like they had back in high school science experiments. The mixture is what’s called a “non-Newtonian fluid” because it hardens when force is applied to it and turns back to goo when the force lets up. They watched YouTube videos of students in Spain who had filled a giant bathtub with the liquid goo and then run across it without falling in. This, plus entering an engineering contest that focused on using simple materials to create a new product, got Saksena and his friends mixing up batches of cornstarch and water by hand outside their dorm room. They put it in trash bags and stuck it in potholes around Case’s campus in Cleveland, Ohio. Then they watched what happened. Just as with the giant bathtub experiment, the students found that the goo did in fact harden when cars drove over it, allowing drivers to avoid the “THUMP, thump” that so many commuters experience. That’s when Saksena got excited. His team had found what could be an easy fix to a common problem, especially in areas with extreme weather. “The more traffic you have and the worse the weather conditions are, like in the Midwest where it swings from very cold to very hot, that’s really hard on pavement,” said William Buttlar, an engineer who specializes in pavement and transportation issues at the University of Illinois. 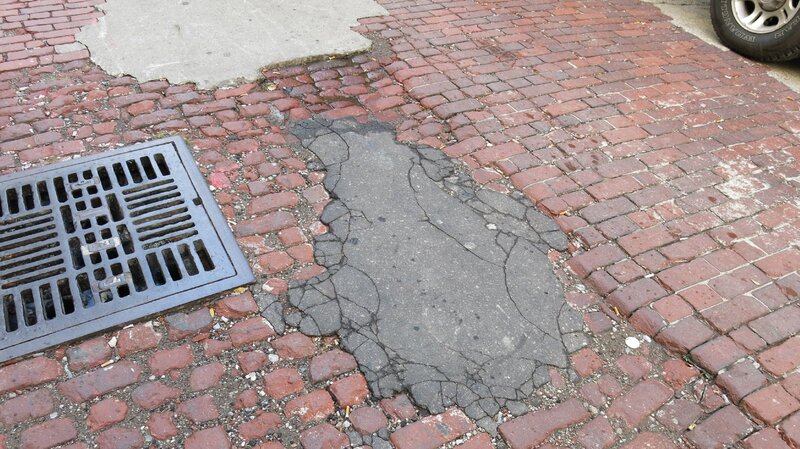 No one likes potholes, and cities often have a backlog of repairs. “It’s frustrating,” said Saksena. 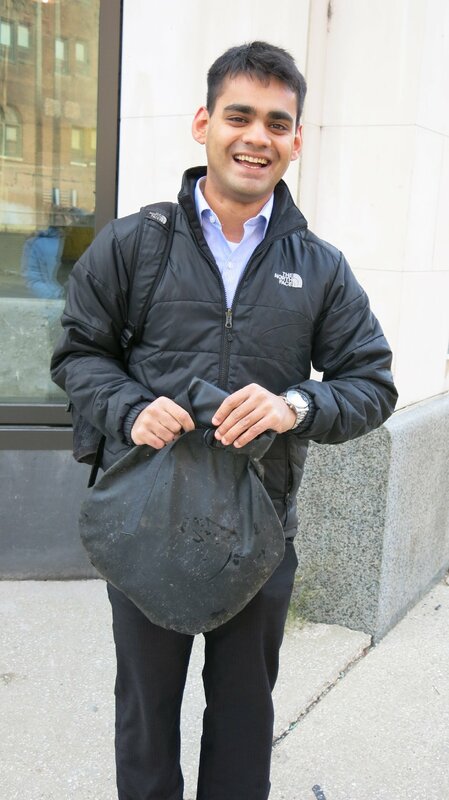 “You’re on your way to work and suddenly you hit a pothole and the coffee spills all over your pants.” Even worse, he added, is the $400 to $500 bill from the auto shop after an encounter with a particularly nasty pothole. Now Saksena and the other co-founders, all still students, have secured grant funding to pursue their invention as a business venture. They’re in the R&D phase now. They have moved on from their initial cornstarch-and-water cocktail and are exploring other possibilities, including silica-based synthetic fluids. They’re hesitant to reveal too much, since they’re in the midst of applying for intellectual property rights. Saksena said the mixture and the bag that holds it are both non-petroleum based and nontoxic. “If the bag were to rip — and it’s designed not to rip — whatever fluid that would come out wouldn’t have a negative impact if it were to seep into groundwater,” he said. 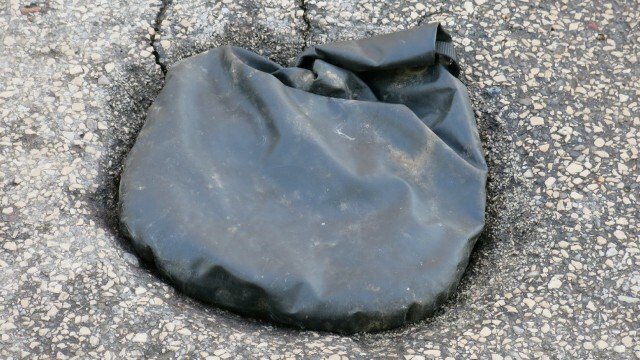 Their product, called Hole Patch, would be an alternative way to temporarily patch potholes during the winter months. The Hole Patch founders don’t see their product as a permanent fix — nothing beats a full repaving of a worn-out street. But permanent pothole fixes can’t be performed in cold and wet weather, so the creators see Hole Patch as a better stop-gap measure. The traditional way to temporarily fix a pothole in winter is called a “cold patch,” a mix of gravel and asphalt. It contains many known toxic and cancer-causing compounds that can migrate into waterways when the asphalt breaks down, according to a report from the National Park Service. The traditional method also requires a half-hour’s worth of labor from a work crew. Hole Patch, by contrast, could be tossed into potholes by just about anyone. Saksena envisions city police and other officials carrying the bags around in their trunks and popping some in when they hit a bump. He said the bag comes in one standard size and can be stacked to fill the dimensions of any pothole. Traditional pothole fills aren’t sustainable and can be costly. The vision for Hole Patch is to help cities repair potholes more efficiently and affordably while using more sustainable materials. “It may not save lives, but it can definitely make someone’s day better,” said Saksena. The product will soon move out of the lab and onto streets across the Midwest and Northeast. A multi-city pilot project is in the works for 2014. Bill Driscoll, a county engineer in Ohio, considers this road testing to be a crucial next step. “What happens when the plows start hitting it?” he asked. The product must hold up in the snow, salt, rain, and true commuter traffic for it to be embraced. “I think most people are going to want to see it in the field and in the ground before they start buying it,” he said. QUEST Ohio’s Hannah Weinberger contributed to the reporting of this article. Where does the water go? If the bactiera eat the dais wast and expels gas, what is left ?